We get it. It’s easy to throw on a pair of headphones and blast music as you’re walking from class back to your student apartment, or stay in and watch Netflix with your cat after you’ve been invited to go out to a party. Being social requires at least some level of effort, and in many cases, meeting a ton of new people can be downright exhausting. Well, you’re a student at the University of Akron, which means that you’re immersing yourself in a diverse environment with thousands upon thousands of people that you’ve never met before. If that thought sounds a little daunting, don’t worry. This is the ideal time in your life to push yourself outside of your comfort zone and try new things, meet new people, and discover exactly what it is that you’d like to do with your life. This is college that we’re talking about, a time where you’re bound to make mistakes but also have a ton of fun in the process…and hey, maybe you’ll learn a thing or two as it relates to your major! The EnVision Apartments, your reliable pet-friendly student apartments near the University of Akron, present you with a few simple and accessible ways to meet new people on campus. Who knows what great connections you’re bound to develop! It’s easy to meet people who are part of a club that caters to your interests. Simply find an on-campus group that congregates and talks about subject matter related to your interest at hand, be it chess, sitcom enthusiasts, or even a group that makes music together in a no-pressure environment. 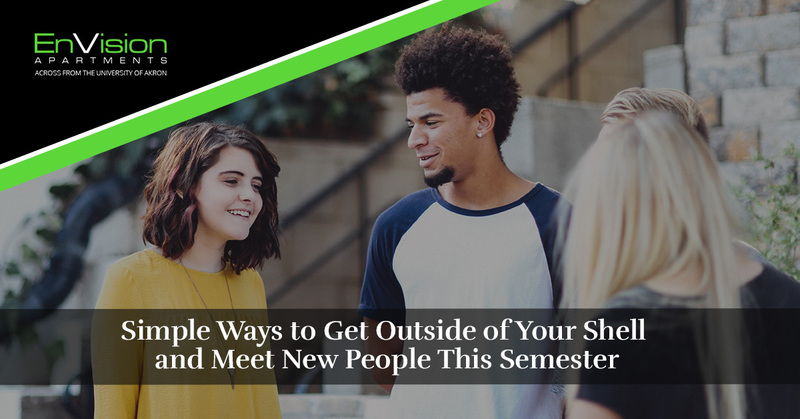 Whatever it is that you’re into, you’re bound to find at least a handful of students who you can connect with. If you have the bandwidth to take on a part-time job, why not make a little side money while meeting new students in the process? You’ll interact with fellow students as fellow employees as well as customers. That will definitely provide an interesting perspective on students that attend the University of Akron, but we’re hoping that you walk away with some worthwhile relationships. Getting exercise, having fun, competing, and meeting new people who you’re playing with: how does that sound? Intramural sports are great because they don’t require the same level of commitment or intensity as league sports, but still offer as much if not even more fun. Accommodating to people of all levels and abilities, there’s an intramural sport out there for you. You’re primarily here to study, so it would only make sense to get to know students who are studying the same subject(s) as you are. Focus on your professor during class, and save the chit-chat for study groups. Though it may be difficult to leave the comfort of your student apartment, it’s reassuring to know that you have a home away from home with the EnVision Apartments. Learn more today!